Megan Fox, 30, and Brian Austin Green, 43, met on the set of Hope & Faith in 2004, and the couple got married in a private ceremony in 2010. Since then, the couple had three beautiful sons, Noah, 4, Bodhi, 2, and three-month-old Journey River. Green posted some adorable photos of the couple’s three sons on Instagram Wednesday, Nov. 16. Green noted in one of the captions that his wife makes beautiful babies. It really is remarkable how Megan Fox has managed to stay fit despite having three children. Brian Austin Green definitely isn’t wrong about his babies being beautiful. Check out some of the photos below. Here is Bodhi and Noah, and Journey in another shot. Fox revealed in April that she was pregnant with Journey almost a year after filing for divorce from Green. Fox and Green had reconciled and were spotted together multiple times following her pregnancy announcement. How is Megan Fox able to stay in such great shape despite having three babies? The actress is very active and has a regular workout and healthy diet to combat post-pregnancy weight. What is Megan Fox’s Workout Routine? Megan Fox worked out throughout her entire last pregnancy with celebrity trainer Harley Pasternak. Fox also educated herself and had an excellent relationship with her doctor. That way she understood safe boundaries regarding how to exercise and eat well during her pregnancies. As a result, Fox wouldn’t overdo her exercise routine, and as she progressed through each trimester, she would modify her program. When she was ready to give birth, the delivery went more smoothly, and she was given medical clearance relatively quickly to resume her workout routine. Within a few weeks, she eased back to her routine. Harley Pasternak developed the 5-factor workout program. It has five phases that include a minimum five-minute cardio warm-up on the bike or treadmill, an upper-body toning triceps extension exercise, a lower-body sculpting lunge exercise, an abdominal sculpting Superman exercise, and a five-minute cool down exercise on the stationary bike. Fox will do 20 repetitions of each lower body, upper body, and abs exercise, cycle through those non-stop, and then repeat them four times. Different body parts are worked at least three days weekly. Post-baby, there isn’t a lot of jumping up and down. On days Fox wants to stay home with the baby, she reportedly works out with the Harley Pasternak Hollywood Workout video game. It was developed for Pasternak’s other new mom clients like Hilary Duff, Jessica Simpson, and Milla Jovovich. Fox’s pregnancy routine also includes cardio, yoga, Pilates, and weight training. 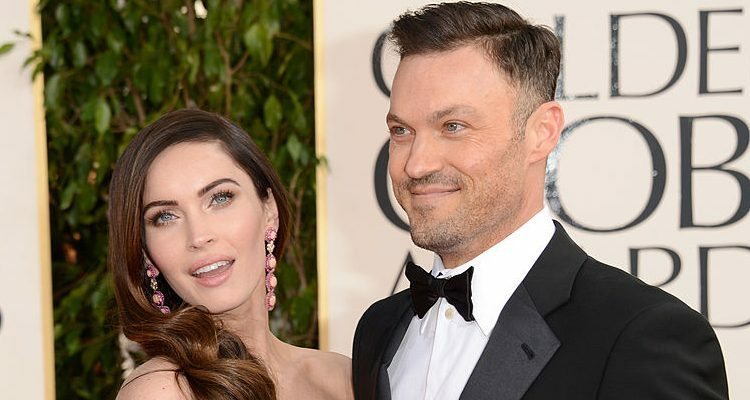 Megan Fox and Brian Austin Green feed the family very well. They both cook and love using the blender. Smoothie recipes are household favorites. Fox loves the red smoothie with fresh berries, protein powder, chai tea, and some almond milk. Overall, Fox has a healthy diet with lots of fruit and vegetables from the local farmers market. She avoids processed foods like white bread, potato chips, crackers, and whole grains. She will always eat breakfast and sometimes eats eggs. Once in a while, she does allow cheat days. Some of her healthy snacks include almonds and salads with apple cider vinegar. Despite her recent pregnancies, Fox has had time for the role of April O’Neil in Teenage Mutant Ninja Turtles (2014) and Teenage Mutant Ninja Turtles: Out of the Shadows (2016). She will next appear in the James Franco-directed comedy called Zeroville. Brucculieri, J., “Brian Austin Green Shares Adorable Photos of His Sons with Megan Fox,” The Huffington Post, Nov. 17, 2016; http://www.huffingtonpost.com/entry/brian-austin-green-megan-fox-kids_us_582e1dc6e4b030997bbe647d. Pasternak, H., “Want Megan Fox’s Killer Body? Harley Pasternak Shares Her Workout,” People Babies website, Sept. 23, 2016; http://people.com/babies/want-megan-foxs-killer-body-harley-pasternak-shares-her-workout/. Fisher, K., “Inside Megan Fox’s Third Pregnancy: What She’s Doing to Stay Fit,” E! News website, May 16, 2016; http://www.eonline.com/news/766075/inside-megan-fox-s-third-pregnancy-what-she-s-doing-to-stay-healthy-and-fit. “Megan Fox Workout Routine Diet Plan,” HealthyCeleb website; http://healthyceleb.com/megan-fox-workout-routine-diet-plan/2910, last accessed Nov. 21, 2016.